vROps is a tool from VMware that helps IT administrators monitor, troubleshoot, and manage the health and capacity of their virtual environment. The VMware vRealize Operations (vROps) Management Suite provides complete information about performance, capacity, and health of our infrastructure. 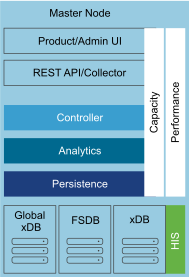 vRealize Operations Manager collects performance data from each object at every level of our virtual environment. It stores and analyzes the data, and uses that analysis to provide real-time information about issues in our virtual environment. The vROps Manager delivers intelligent operations management with application-to-storage visibility across physical, virtual, and cloud infrastructures. We can automate key processes and improve IT efficiency by using policy-based automation. Using the data collected from system resources, vROps Manager identifies issues before the customer notices a problem, and suggests necessary actions to take to fix the problem. vRealize Operations Manager tracks and analyzes the operation of multiple data sources within the Software-Defined Data Center. It uses specialized analytics algorithms to learn and predict the behavior of every object it monitors. Views, reports, and dashboards help the users to get all information. We can deploy several vRealize Operations Manager instances in a cluster with the various roles for HA and scalability. Master Node – Manages all other nodes in large scale environments and single standalone vROps Manager node in small-scale environments. Master Replica Node – Enables the HA of the master node. Data Node – Enables scale-out of vRealize Operations Manager in larger environments. Remote Collector Node – Remote collector nodes only gather objects for the inventory and forward collected data to the data nodes. It does not store data or perform the analysis. Analytics clusters – Track, analyzes and predict the operation of monitored systems. Consists of a master node, data nodes, and optionally of a master replica node. Remote collectors cluster – Only collects diagnostics data without storage or analysis. It only consists of remote collector nodes. Admin / Product UI server– The UI server is a web application that serves as both user and administration interface. 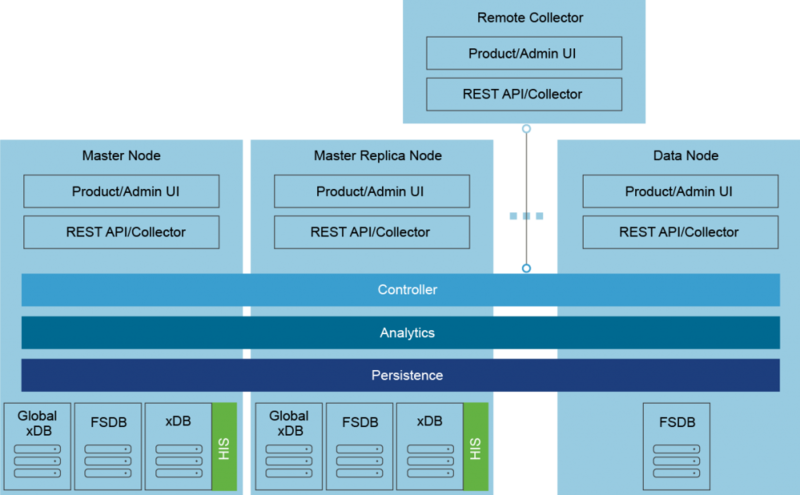 REST API / Collector– The Collector collects data from all components in the data center. Controller-The Controller handles the data flow of the UI server, Collector, and analytics engine. Analytics– The Analytics engine creates all associations and correlations between various data sets, handles all super metric calculations, performs all capacity planning functions, and handles triggering alerts. Persistence– The persistence layer handles the read and write operations on the databases across all nodes. FSDB– The File System Database stores collected metrics in raw format, and it is available in all the nodes. xDB (HIS)-The xDB stores data from the Historical Inventory Service (HIS) which is available only on the master and master replica nodes. Global xDB– Stores user preferences, alerts, and alarms, and customization that is related to the vRealize Operations Manager. It is available only on the master and master replica nodes. Management Packs– Contain extensions and third-party integration software. They add dashboards, alert definitions, policies, reports, and other content to the inventory of vRealize Operations Manager. VMware vRealize Operations (vROps) uses Badges as a way to test objects. The three crucial badges it uses are Health, Risk, and Efficiency. This is a high-level indicator of the overall status of your environment. It is the first badge that should be looked at by an administrator and take necessary action as soon as possible. Indicates potential problems that lead to degrading the performance of the system. Risk indicates problems that might require your attention in the near future, but not immediately. It does not tell you about current or future performance problems but shows how to run a more efficient datacenter. It is imperative to understand these badges. They help us to take necessary action to correct and avoid problems. vROps is a robust operation management solution with numerous facets and use cases. To fully understand how you can derive the optimum use of vROps, reach out to us and we’d love to help you.